appealing to President Aquino to personally look into this matter. Ortinez has denied ownership of the carbine bullet wrapped in red cloth, and said that she would never bring in such ammunition knowing that Hong Kong has very strict security laws. Ople said she spoke with Atty. Spocky Farolan, the OFW’s counsel, who confirmed that the bullet shown as evidence was not the same as the carbine bullet said to be have been discovered in Ortinez’s bag. “Nanawagan ako sa Department of Justice na iurong na lang ang demanda dahil malinaw naman na inosente si Nanay Gloria. Bakit naman niya ilalagay sa alanganin ang kanyang trabaho sa Hong Kong para sa isang bala? Sa tagal na niya bilang isang OFW, alam na alam niya na bawal ito hindi lang sa ating batas kung hindi pati na sa batas ng Hong Kong,” Ople added. The Ople Center has conveyed through Atty. Farolan its willingness to help Nanay Gloria and her family throughout this ordeal. “We are prepared to assist her until she obtains justice and is able to move on with her life as an OFW,” Susan Ople said. The OFW advocate also called for reforms in airport and security management as she pointed out that the airport has become a hotbed of unprecedented cruelty directed against OFWs. 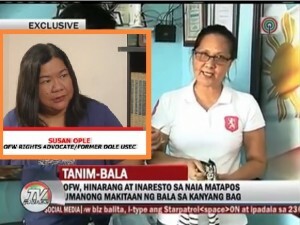 “From the illegal exaction of terminal fees, to the opening of balikbayan boxes, and continuous attempts to extort money from OFWs, the current NAIA and DOTC management have consistently displayed insensitivity and lack of respect for the rights of OFWs,” Ople said. The OFW advocate called on Congress to investigate the pattern of deliberate actions undertaken by the DOTC and MIAA that have chipped away at the hard-fought rights and benefits of OFWs.